MIA: John Edwards’ common sense? Sorry, I can’t let this pass without commenting……since the media seems to be making a big deal out of John Edwards’ comments today blasting Hillary Clinton for not saying specifically how many troops would she remove from Iraq nor give any specific dates. Come on, John, how irresponsible would it be for any candidtate to give such specifics without being involved in the high-level meetings that include the generals responsible for the military operations as well as the secretary of defense, national security advisor, and secretary of state? HIGHLY irresponsible, and amongst the LEAST of the problems making such promises would lead to is, well broken promises. Hillary has taken the only responsible path available – promising to address the issue early in her presidency (assuming she is elected) and promising to make withdrawal from Iraq, in a responsible manner, a top priority. 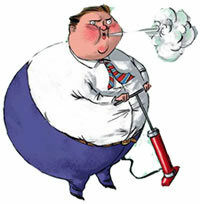 Any candidate who promises more, or more specifics, is just blowing hot air. Everyone I’ve talked to today about this is intelligent enough to know that John Edwards is desperately trying to turn America’s growing frustration over the war in Irag against Hillary, which is not where it belongs (hello? Remember our current President who got us in there, John?). I hope the rest of the registered voters in this country are equally as intelligent, and see Edwards’ attacks for what they are – baseless, unfounded, and irresponsible. November is almost upon us, and for many of us our thoughts are turning to a Holiday ritual that, for some, is a dreaded (and sometimes expensive) chore. I’m referring to the mailing of Holiday gift cards to friends and family. This year my significant other and I have decided to do something different – we’re sending eGreetings instead. Now, I know there are a lot of people who feel that an emailed Holiday greeting is tacky – sort of like an emailed invitation to a formal party or wedding. So for those people I must explain….. Although we’ve always been “concerned” about the environment (which in the past was primarily focused on cleaning up air & water pollution, removing trash from public areas, and paying lip service to the problem of overpopulation), the past year has witnessed a deepened commitment from us to reducing our footprint on this planet. We’ve replaced all our light bulbs with CF bulbs, work hard at conserving both water and energy, increased our attention on recycling (it used to take a few weeks to fill our recycle bin, now it’s usually overflowing each week when we set it out on the curb), and I’m in the process of replacing my old SUV for a Hybrid vehicle. We also pay closer attention to our use of (and recycling of) paper products, and stopped our newspaper delivery after realizing we were getting more and more of our news online, and I now take a collection of mismatched canvas bags to the grocery store when I shop, to avoid the lose-lose choice of “paper or plastic”. To that end, we have decided that the best thing we can do this holiday season, in keeping with our commitment, is to NOT mail out a bunch of cards. Our trees are one of our greatest natural resources, along with water, without which we humans cannot live. For years we’ve been hearing about how quickly the Amazon basin rainforest (and other old growth forests) are being razed, sometimes illegally, to make way for development and ranching. This issue desperately needs more attention – after all, no trees = no oxygen, and how long would we survive with no oxygen? Not long. 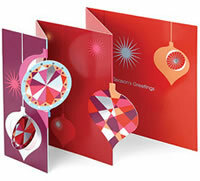 Since it takes killing trees to make cards, not sending cards will hopefully contribute to killing fewer trees. Instead we are taking what we would have spent on cards and postage, and donating it to the World WildLife Fund, a multinational conservation organization dedicated to the preservation and protection of nature and our natural resources. We know our family and friends will understand when they receive an email explaining what we’re doing this year, along with our picture and best wishes for the coming year. We hope they will follow suit. Juice is the new Buzz....whatever has people talking. The ideas, events, and words on the tips of our collective tongue. Deb on Please stop sending me return address labels! Rebecca Thorman on Girls just wanna have Blogs? Heidi Miller on Girls just wanna have Blogs? Trisha on The Darkside of Facebook and MySpace? Joanna on The Darkside of Facebook and MySpace? Trisha on Turning American Soldiers into Crusaders? Jason on Turning American Soldiers into Crusaders? You mean Reality TV isn’t real? Have the Emmys lost their shine? Please stop sending me return address labels! Do you put your money where your heart is? God’s Warriors – which ones were the scariest? Hillary & Barack – would you vote for it?